A look down the throat of QFI’s new automated panel bender provides a close-up look at the segmented upper blankholder tooling and lower counterblade tools, as the rotator (top left) mounted to the blank manipulator prepares to place a drawer blank in front of the press. Lean manufacturing at its core simply means eliminating, or at least minimizing, wasteful or non-value-added processes and procedures. On the non-value-added list: Machine setups, a necessary yet wasteful evil. While metalformers can’t eliminate setups altogether, they certainly can minimize the time taken between production runs to set up new jobs. At metal fabricator Quality Fabricators Inc. (QFI), Addison, IL, lean has been the name of the game for the last several years, and setup-time reduction has been a key lean initiative. 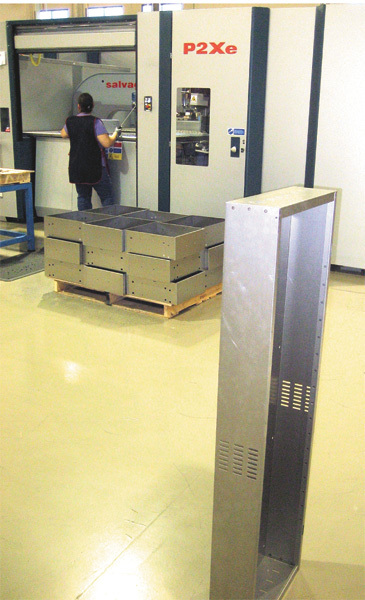 As the firm’s order quantities have shrunk for the sheetmetal enclosures, carts, drawers and similar products it fabricates, its managers and engineers have retaliated by taking steps to slash setup times. We’re talking offline programming of CNC press brakes, real-time bend-angle detection adjustment and other techniques targeted at minimizing operator intervention (wasteful) and optimizing overall equipment effectiveness (value added). Lean’s Great, But How to Handle Double the Order Quantities? QFI’s lean focus did wonders for throughput and productivity, but when orders recently increased for one of its key product lines, a fresh look at sheetmetal-forming technology was in order. The job in question for the 124,000-sq.-ft. 100-person shop, which serves the oil processing, medical, military, computer, electronics and other industries: fabrication of enclosures. “We now make tens of thousands of enclosures annually,” says Victor Camacho, QFI vice president of operations, “a substantial increase in annual volume from just a couple of years ago.” Enclosures are fabricated from 16 to 18 gauge cold-rolled steel or aluminum sheet. Such growth in sales, while a nice problem to have, challenged the firm’s fabricating capacity. Until recently, the firm fabricated cabinets and enclosures on a manually tooled folding machine, to the tune of 130 to150 per 8-hr. shift. 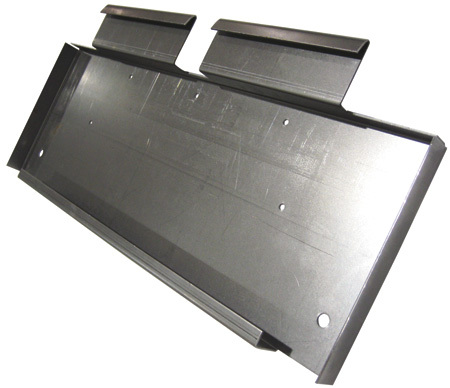 To take advantage of the panel bender’s efficiency and capabilities, QFI engineers have redesigned some of the products it fabricates for customers, including this HVAC enclosure. Tabs were moved from the outside of the part to the inside to allow the part to run on the panel bender. As a result, productivity quadrupled compared to forming the parts on CNC press brakes. “When orders started ramping up, late in 2010 and into 2011, the folding machine simply couldn’t keep up,” says Camacho. “We had to offload some production to our CNC press brakes, not a very effective solution since the typical enclosure requires 11 different bends.” Among the concerns: operator error that crept in due to the excessive amount of blank handling required to make the large number of bends, as well as inefficient tool changes. …QFI invested in a new automated panel bender—a P2Xe compact panel bender from Salvagnini. The machine is equipped with an automatic tool changer that enables setup changes to occur in a matter of seconds. That’s brought an entirely new level of flexibility to QFI’s production scheduling. Mautone cites a few key features of the new panel bender that allow it to more than double throughput. First, when the operator loads a blank into the machine, it’s centered just once, at the start of the bending cycle—there’s no need to re-center the blank after each bend. Also, the design of the segmented bending tool is such that the blankholder conforms automatically and instantly to the part dimensions. The blankholder can expand or contract in 0.020-in. increments to accommodate a wide range of bend dimensions. If you’ve never seen an automatic panel bender run through its paces, the nimble, fast and accurate machines are quite a sight to see. The automatic manipulator grips the blank and quickly indexes it on a horizontal plane in and out of the bend tooling. A rotator turns the blank to present each edge of the part to the tooling, to enable rapid-fire forming up or down. Control capabilities of the rotator include adjustable gripping pressure, so as to not mar the surface finish of the workpiece—particularly important when QFI runs aluminum sheet through the bender. Maximum bend length on the P2Xe is 86 in., yet the compact machine occupies a compact footprint measuring only 19.7 by 9.8 ft. The panel bender forms this part—10 by 20 in.—at a rate of 400 per 8-hr. shift, compared to 200 per shift using two separate setups on a press brake. The second setup was required to hem the hangers, easily tackled by the panel bender. With the P2Xe in production at QFI since January 2012, Altman has been able to move some 85 different jobs over from its press brakes and folding machine, including the various enclosures that consume about 50 percent of its capacity over two daily shifts. Overall, the machine is running at about 90 percent capacity. 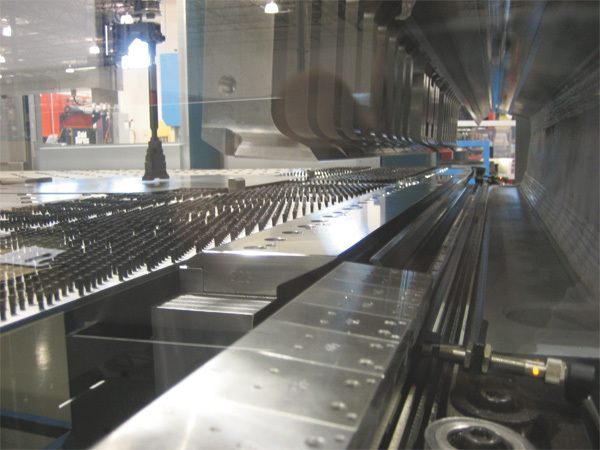 “Yes, a second panel bender could be on the horizon if orders continue to climb for our products, or if we’re able to attract other thin-gauge sheetmetal-forming work that fits well with the panel bender’s capabilities,” says Mautone. The bender does have certain limitations, including a maximum bend height of 63⁄4 in., and a minimum edge dimension of 11 in. “While we can’t form very small parts on it,” says Mautone, “the large number of part numbers that we have been able to move over to the bender from our press brakes has freed up hours upon hours of press-brake capacity to allow us to take on additional heavier-gauge forming. And we’ve even been able to redesign some of the products for our customers, to take advantage of the panel bender’s efficiency and capabilities.